The integrated NOVAK GPS+Laser system combines and maximizes the advantages of both systems. This system allows using the GPS to obtain the location of the machine on the ground and the laser system to adjust the blade height. The result is high positioning accuracy and ease of movement. This system allows an operating range of about 1300 m.
The touchscreen will display arrows that indicate which way the operator needs to go to optimize the work. The processing is completely automated because the system will raise the receiver until it receives the laser beam. Depending on tractor power and grader size, it will define the optimal depth of cut. 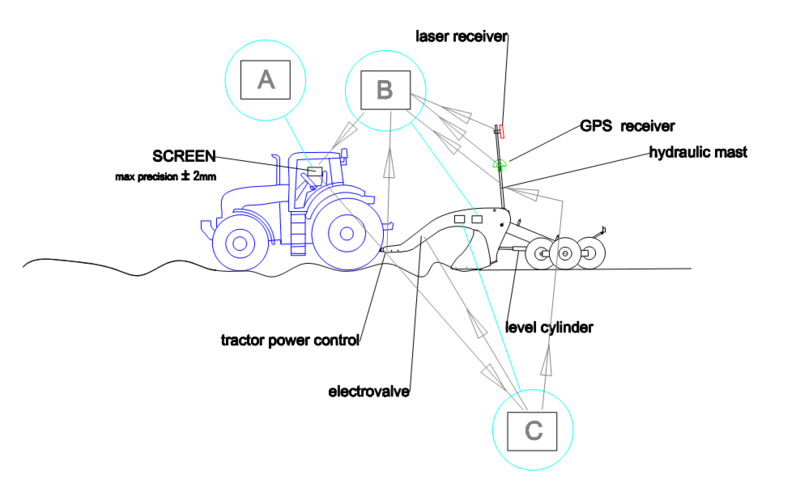 The system will update the model and the areas where to steer the grader at each pass. This system can also be used by unexperienced operators; the final result will nonetheless be highly accurate. One example: If the ground plane to be levelled is one hectare (100×100 m), showing a maximum height difference of 20 cm and a maximum distance of 80 cm between the excavation and filling areas, with medium mixture soil and with a relative humidity of about 45%, it can be leveled in 6 hours, using a tractor with 120 HP towing a 4 m grader. Another example: if the field has once again 1 hectare and was already leveled but needs a higher planarity accuracy to compensate for height differences of 2-3 cm, it can be worked in about 1.5 hours if the other conditions are equal to the example above.